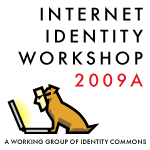 At a typical conference, you listen to thought leaders; at the Internet Identity Workshop unconference, you and your peers lead together. Be a part of it: May 18-20, 2009 at the Computer History Museum, Mountain View, California. Register now! Special bonus offer: Continuing a tradition dating back to the second IIW, Microsoft will be sponsoring a dinner for conference participants.